Whisky has a long-standing tradition as an important part of the lives of Torontonians. In the 2006 census, over 20 per cent of Toronto’s population claimed their origins as Scottish or Irish — hailing from the countries where whisky was born. Although you can find a considerable amount of bars serving both Irish and Scottish traditional brands, Toronto doesn’t lack a variety of Canadian whisky brands either. Most Canadian whiskies are blended multi-grain liquors containing a large percentage of corn spirits and are typically lighter and smoother than other whiskies. The tradition of whisky making made Ontario and especially Toronto some of the capitals of high-quality whisky drinking. In the early Canadian farming economy, whisky even functioned as an alternative currency. Instead of payment in cash, people sometimes took payment in spirits. (And this tradition is alive and well when it comes to repaying favours from friends!) Soon, Canadian whisky became a highly sought-after product. One of the biggest booms for Ontario whisky production came with Prohibition in the United States. Canadian whisky featured prominently in rum-running into the US at that time. Hiram Walker’s distillery in Windsor, Ontario, directly across the Detroit River from Detroit, Michigan, easily served bootleggers using small fast smuggling boats. As you can see, whisky is a spirit that goes way back to the roots of our city, and today we would like to honour this by presenting the crème de la crème of Toronto’s whisky bars. The Feathers is a pub you should definitely visit if you’ve ever been to London and liked the English pub experience. It’s not just one person that says so; it’s almost everybody that’s visited The Feathers. It looks like a typical British pub with everything you’d expect — even the clientele have that shifty look British people get after a few glasses of whisky. As far as the atmosphere goes, The Feathers is hard to beat. However, the service is not the fastest, and unfortunately a lot of meals from the menu are a bit too British. (For those who haven’t had the good fortune of experiencing British cuisine, if somebody offers you some traditional British fare, it might be best to run!) Since we’ve dealt with the “complexities” of British cuisine, let’s have a look at the whisky menu, since that’s the most important aspect of this article. We asked Reid Pickering, the owner of The Feathers, which he reckons is the best whisky on their menu. I don’t think there is a best. We currently feature over 400 single malts on our menu, many of which are from closed or ‘silent’ stills. Choosing a best would be like choosing the best music or song, it all depends on your mood. However, our house Signatory bottling Islay Cask Strength is a great seller and excellent value at $5.99. Other than that the Islays in general, Lagavulin, Bowmore, Ardbeg are also good sellers. We do have some rare malts on our menu and are on our last bottles so once they are gone, they are gone. We also asked whether The Feathers serves any special cocktails with whisky or if the staff are purists who don’t put whisky in cocktails. The question was met with a strict denial of any cocktails. Reid even suggested that it wouldn’t be wise to add ice to your drink — maybe just a drop of water. We are Toronto’s only real Scottish Restaurant and Malt Bar. I am from Huntly Aberdeenshire and was tired of the themed pubs and bars in Toronto so with my husband and whisky buff, we opened The Caledonian in 2010. Caledonia is the word the Romans used to describe the Scots of the north east where I am from in the 4th Century… so ‘Caledonian’ means a Scot from the northeast. The place is very classy and tasteful; you feel like you’ve come home as soon as you step inside. As usual, when you hear too many positive things about a place, it can only mean only one thing: it’s almost constantly packed. I’m not kidding. Especially during dinners, The Caledonian is apparently one of the favourite go-to places in the area. We recommend booking a reservation at least one day in advance. We also asked Donna about the most important thing: their whisky. You can tell she really knows almost everything there is to know about Scottish whisky from the way she talks about it. 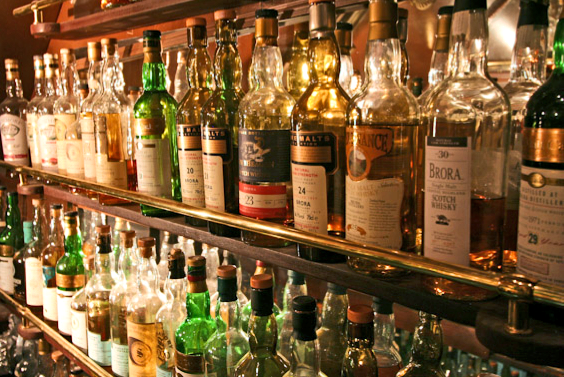 Our list is primarily Scottish malts. We have 150 different malts that range from all six Regions: Highland, Lowland, Speyside, Island, Campbelltown, and Islay. Whisky is a very personal experience. I am partial to Glendronach, as it is my hometown distillery. Glendronach is a classic sherried full-bodied malt — quite like Macallan. My husband‘s love is Highland Park, in particular Highland Park 18 year. Our best selling malt is Ardbeg 10 year, which is a heavily Peated Phenolic Islay Malt. We are Canada’s top seller of Ardbeg according to LVMH, its owners. However, it is not only Donna and her husband who are whisky experts. If you ask anyone on staff, they are all very knowledgeable as well. The Caledonian also serves whisky in cocktails, as they believe it can be enjoyed in many ways. (The Ardbeg Caesar, Rusty Nail, Auchy Toddy, Vodka Irn Bru, Smokey Martini, and Rob Roy are among the recommended cocktails.) 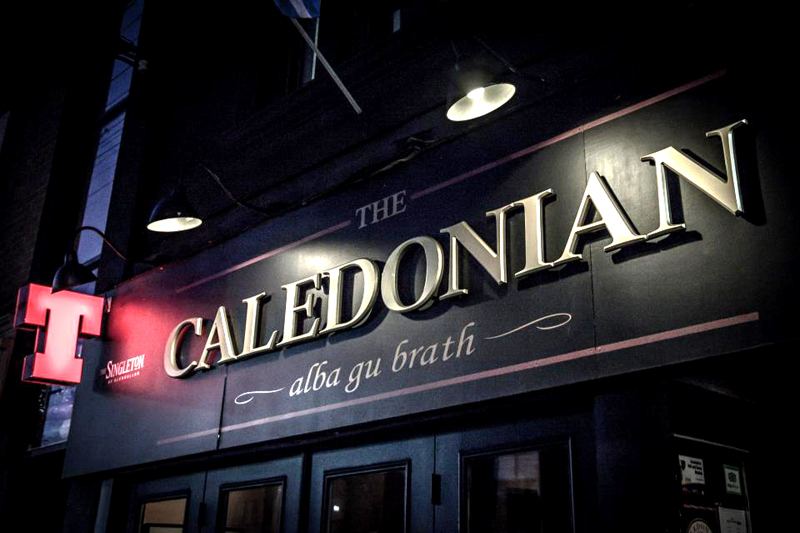 The Caledonian also “deals directly with many distillers in Scotland and [has] an Ambassador here from Scotland once a month for a tutored tasting.” Now that’s what we call commitment to the profession! College Street seems to attract good whisky bars. 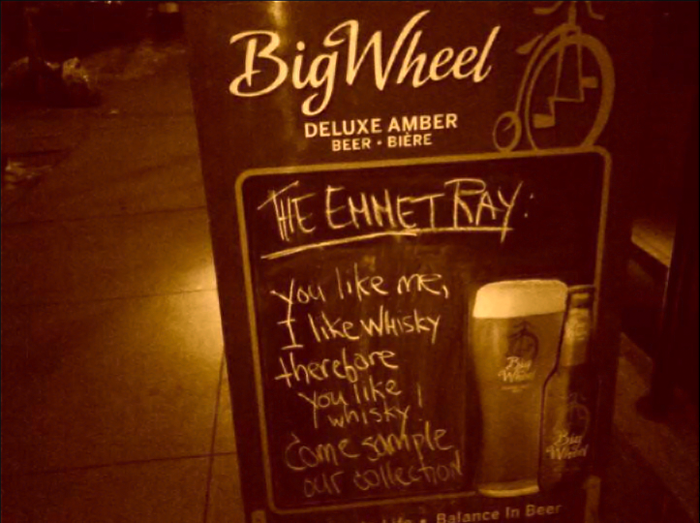 Only two streets down from The Caledonian, bar owner Andrew Keiser serves fine whisky and offers live music entertainment in The Emmet Ray. The Emmet Ray Currently has 184 whiskies from around the world, specializing in Canada, USA, Scotland, and Ireland, but we’re also adding some from Japan, Sweden, India, Wales, and Australia. 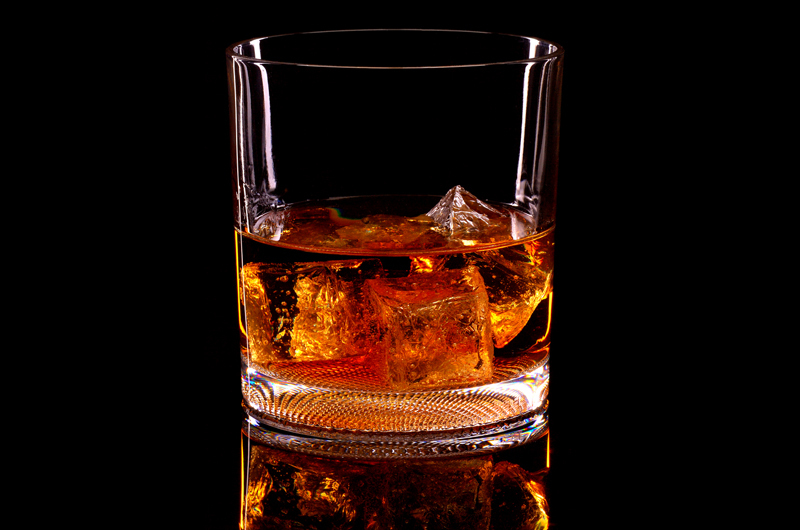 Currently speaking, the trend is Bourbon; however, Single Malt Scotch is always a staple, but recently Canadian whisky is ever-growing in sales. The Emmet Ray offers a very complex experience. The first step toward a wonderful evening here is to enjoy the exquisitely prepared food. The Emmet Ray surprised us with the high standard of their meals. We preferred their Steakhouse Cheese Burger, which is simply incredible but also one of the simpler meals. If you want to taste something really unusual, the Scotch Fondue might be your choice. (We didn’t really fancy it, but to each their own.) All the meat they serve is sourced from high-quality Ontario farms, completely free of added hormones, steroids, and antibiotics! Gigs usually start around 9:00 or 10:00 P.M., but it’s better to arrive a bit sooner to eat and enjoy the conversation, because once the band starts playing intimate conversation is not really an option anymore. Whisky goes very well with music. They usually feature jazz bands, with occasional rockabilly, folk, and blues. They also feature DJs playing hip hop and soul — which is in our opinion really unfortunate, since they don’t go with the character of the place at all. However, if you avoid Saturdays, you can be sure to avoid the disappointment. Andrew knows how to appreciate Canadian whisky, so we asked him whether he thinks Canadian whisky can compete with Scotch and Irish brands. One hundred per cent yes, but ‘compete’ should be very different than ‘comparing.’ Each region has distinct characteristics, satisfying different tastes and desires. Sometimes there is nothing I would want more than an old Canadian Whisky, with a mellow finish; however, there are other times I want the complexity an aged single malt scotch might give you. Therefore time and place play a huge role. I look for diversity in what I drink. 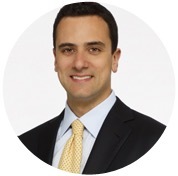 All brands have their strengths and weaknesses. That being said, Glenmorangie has always had my interest when it comes to single malt Scotch, and Forty Creek in Canada has been pushing the boundaries of Canadian whisky for years now. But Sazerac in the USA seems to be dominating the rye and bourbon market. So, to compare any of these brands together or within themselves, I would not want to venture to try. Spirithouse is a little bit like marmite or coastal weather (bear with us, there is a point): you either hate it or love it, but your preference can change very easily. The thing is, once you experience how brilliant Spirithouse is with whisky, you’d be willing to overlook its flaws. Spirits are made to be enjoyed both on their own or mixed in a cocktail. You just have to know which ones to mix and which ones to enjoy alone. We serve many cocktails that cross these worlds together, and guests are surprised that we would do that and make it work. Our motto is: If it tastes good, drink it. If it doesn’t, don’t. You might expect more articulate expression from a place associated with The Toronto Institute of Bartending — and you might also expect better cocktails. In accordance with their philosophy, they do experiment quite a bit — we feel maybe even a bit too much — with some cocktails. 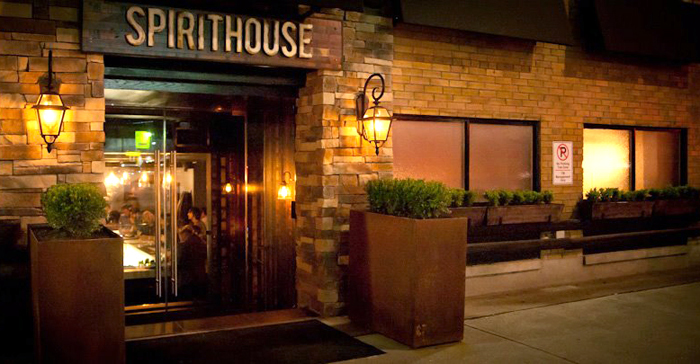 Our recommendation is to stick to pure whisky and you’ll have a great time in Spirithouse, with one exception: you have to try The Old Fashioned, a cocktail mixed with Bulleit Bourbon (Spirithouse’s house brand). Spirithouse is a really neat and classy place to go. You’ll be seated in old-time booths, which are really great for having evening drinks with a group of friends because even though there will be music and a lot of people around, you can have a nice uninterrupted conversation. They use iPads to place their orders. This meant, at least for us, that they really put an effort to keep up with modern trends. 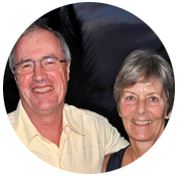 Len is one of the owners that’s not afraid to stand up for a Canadian whisky. Corby Distilleries just re-released “Lot 40” , a Canadian whisky made heavily with rye. Great taste profile, and will match up to any great bourbon or Scotch. Crown Royal Black also delivers a beautiful flavour, which can be compared to a Bourbon. Spirithouse is the place where you can see one of the biggest mixtures of different customers in terms of age and background. Len also told us that until now, mostly men used to drink whisky, but as palettes are moving from sweet to more complex and bold, more and more women in their mid-20s are becoming whisky fans. There is no doubt that Toronto whisky bars famous around the world. After read your blog I want also look the Feathers’ special whisky events, where they crack some of their rare-collection whiskies. I agree with Best whisky in india, special events in Toronto bars entice.